This page features our best understanding of the resonant strategies needed to access some sophisticated sounds that the voice can achieve. Understanding the interplay between formants and harmonics is essential to understanding extended techniques and how to create varied resonant strategies. For more information, read our Harmonics Vs. Formants page. What are "Out Of The Box" techniques or what some call "Extended Techniques"? In every vocal tradition on the planet, people have developed what they might consider to be their more "normal" approaches to vocalization. If we pause to notice, it doesn't take long to realize that what we may consider normal is quite varied. Different vocal traditions have also developed around specialized use of the vocal tract and vocal folds to create effects that can seem mysterious and other worldly. The incredible human voice has such a wide range of capacity thanks to our mobile resonator (vocal tract) and profoundly flexible vocal source (vocal folds) that we have access to some incredible opportunities when it comes to sound making. Turbulences, focused harmonic filtering, vocal fold agility, and pronounced resonant strategies are some of the options available to us as we explore these opportunities. If certain sounds are normal in your sonic world, you may not think them outside of the box, but, then, what other sounds might rest outside of your own? You can define the "box" by whatever is normal to you, and then start exploring other sounds from there. People sometimes consider the creation of new vocal sounds to be inherently harmful to the voice. Your voice is a sensitive instrument and can be harmed. Learning to sing in a new fashion certainly has its risks, as does many of the “normal” exercises that we perform. Whenever you try something new with your voice, to take it slow, listen to your body, stop if anything hurts, and consult a doctor if you feel like something is persistently wrong. Knowing how to create new sounds is one step in the discovery process, and opens a lot of doors at first. Patient, consistent practice is the key to creating meaningful, lasting habits that allow the body to perform in miraculous ways. A note to composers: Standard western notation has little capacity for communicating many of the specialized opportunities available to vocalists. Equally, singers might be less familiar with one or many specialized techniques. When using them in your pieces, consider the ability level of the group for whom you are writing. Consult other composers who have utilized them in the past to help you determine notation options, and inherent challenges. We're happy to discuss options, and frequently teach courses to guide composers into exploring ways to communicate their intentions for vocalists. Fahad Siadat at www.seeadot.com is also a great resource. Or, ask a singing colleague to give you feedback on your choices, and consider writing an explanation in the notes to your piece to further explain what you would like the singers to do, and where they can go to find more information. Belting, to Western classical music, is the “original” extended technique. It appears in so many styles of singing, that people the world over recognize its customary spread of harmonic activity as "normal" when they hear it. The belter’s brassy, vibrant tone quality can be a real thing of beauty, and can be quite varied in approach and meaning. At its core, the Belt involves a sustained energy boost from the first formant (F1) of one of the second to ninth harmonics (H2-H9), or, a “hey” resonant strategy (see our Acoustic Strategies page). Most typically, the first formant (F1) couples with the 2nd, 3rd, or 4th harmonics (H2, H3, or H4) in the middle of the vocal range. As belters move into what is often called a "high belt" above D5 they adjust acoustically into an acoustic mix. In this case, most typically, the first formant (F1) boosts between the first (H1) and second (H2) harmonics, or the second (H2) and third (H3). These acoustic strategies allow for the majority of the vocal folds to remain in contact even as they are stretched more thinly as pitch rises. With more muscle mass in contact, the overall acoustic energy output from the vocal folds is more robust, giving more overall energy to all harmonics, and therefore creating a more brilliant, if potentially less differentiated, sound. 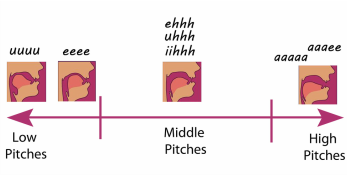 This "hey" acoustic strategy can occur in most parts of the vocal range, hence the wide range of belting tone qualities that occur throughout the world. A secondary acoustic element often seen in belting, though not always, has to do with the other energy peaks (formants) of the vocal tract. In many types of belting, the upper formants spread out, thereby spreading their energy boosting capacity more evenly across the harmonics produced by the vocal folds. Notice in the image below how even the energy is across all of the harmonics, and how harmonics up to 10,000HZ still have an active presence in the sound. One of the reasons that western classical singing considers belting "out of the box" has to do with this strategy. By contrast, western classical singing strives to focus formants on very specific harmonic bands, thereby creating highly differentiated resonant strategies. 1) In order for the first formant (F1) to boost higher harmonics, the shape of the vocal tract has to be smaller overall. Physics only allows for the vocal tract to narrow so much. Psychologically, vocalists will often try to over narrow, especially the throat (associated with F1), in order to create the perception of high harmonics in the sound, rather than letting their twang and other subtle shifts do this more difficult task. This leads to the tell-tale throat squeezing and jaw thrusting associated with belting. 2) While training the body to use more vocal fold mass, vocalists can be slow to teach their bodies the benefits of the subtle interaction of all of the vocal fold muscles (see Inside The Larynx for more). Vocalists who experience a "break" or feel a "wall/ceiling" at some point in their range understand that to maximize on vocal fold mass at the loss of flexibility can feel like a hard trade off. The resultant tension from attempting to maintain vocal fold mass without training for muscular trade off can also create vocal health challenges. Today's head/chest (or CT/TA) mythologies often lead to further, and unnecessary, complications in this regard. 3) Twang helps to make belting a simpler experience, but is often counter-intuitive to belters. Twang, or the focusing of the epilarynx tube in relationship with the shape of the throat (known in western classical singing as "the singer's formant"), creates incredible increase in acoustic energy, thereby helping the vocal folds stabilize. It also brings focus to the sound. There are belting styles that have less twang and rely more on the vocal fold's abilities to remain in contact even under heavy pressure (called the "overdrive" method by some), and they have specific acoustical properties. Belting styles that avoid the benefits of epilaryngeal twang, however, tend to be less flexible, and more fatiguing, in general. Aligning the Formant 1 (F1) energy boost with an upper harmonic (the second harmonic (H2) in this case) is essential to many kinds of belting. Notice how the 1st Formant energy boost (on the left) aligns with the second harmonic (in the center) for an overall boost (on the right). Notice too, the energy in all of the upper harmonics, and how the upper formants (on the left) are spaced out to ensure an even harmonic spread. The Eastern-European Balkan style of singing employs belting. Notice how the fundamental harmonic (H1) is very pale in comparison to the 2nd, 3rd, and 4th harmonics (H2, H3, and H4). The first formant of this singer is boosting between the second (H2) and third (H3) harmonics, very close to H3. This acoustic mix between H2/H3 resonant strategy shows an example of belting that utilizes the first formant energy between harmonics, and is part of what makes the timbre of Balkan singing different from other belting styles. This singer is also using a formant coupling strategy similar to western classical singing, where the 2nd formant (F2) drops low, surrounding the third harmonic (H3) from above. Notice how the upper harmonics are still very present, owing to the increased muscle mass engagement, and even spread of the upper formants. 1) Learn to whine. Include the toddler whine (“I don’t waaanna!”) in every warm up, and use it with straw phonation. This will help develop twang in the sound. Try to develop independence of the vocal tract from the whine by combining [u] qualities (think and owl "whoo") with the toddler whine. Can you feel a stable vocal tract in your preparation breath? Can you whine-glide while maintaining that stable vocal tract? Can you do the same with the vocal fry? By definition the vocal tract is going to change shape during belting in order for the first formant (F1) to track with upper harmonics. However, teaching your body to stabilize the vocal tract helps you make the vocal tract shape changes that you want when you want them. Maintaining twang through vowel shape changes will help the difficult notes in your range become much more manageable. 2) Listen to the twang region, and target harmonic areas: Using a vocal analyzer like Voce Vista, filter out the harmonics that you most want to hear in your sound, including the ones boosted by the first formant (F1) and the twang region (@2000-3500HZ). Let your ear guide your vocal folds. 3) Practice your smile. 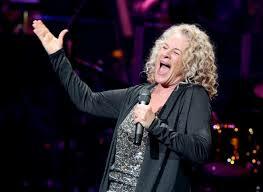 One key to belting is learning to shorten your vocal tract while avoiding excessive tension. Smiling is a quick way to do this, as it raises the pitch of all Formant Areas. Jaw dropping does the same thing, and often goes together with the smile. 4) Notice your Formant 1 (F1) area. For resonant strategies that focus on upper harmonics high into your range, the physical area associated with Formant 1 (F1) will have to get smaller. The trick is to avoid the sensation that you are forcing it to get smaller. Listen for the vowel shape changes to help you know when and how your first formant (F1) is changing. Try singing vowel chains on single notes to feel the ways that the first formant (F1) changes, and then try gliding through your range on single vowel shapes, and on vowel chains, to feel those subtle, but essential, changes. Belting will often occur more easily on higher-pitched vowel shapes like [a] and [ae] because they allow the vocal tract to accentuate higher harmonics, thereby achieving the belting goals. These are also often the hardest vowel shapes to twang on for several reasons, so practice whining them. Practicing them in combination with lower pitched vowel shapes like [i] and middle vowel shapes like [e] will help you develop twang stability across vowel shapes. That's why the favorite exercise for some belters, "Taxi! Hey Taxi!" , works, in addition, of course, to its perceived proximity to Broadway. These exercises can help you move into the belting technique in a healthier way, as they encourage attention to your body, and training predictable adjustments. In order to create idiomatic belting sounds, you'll need to listen to the people who are singing in your preferred style, and use some good, old-fashioned mimicking to take your belt to the finishing stages. 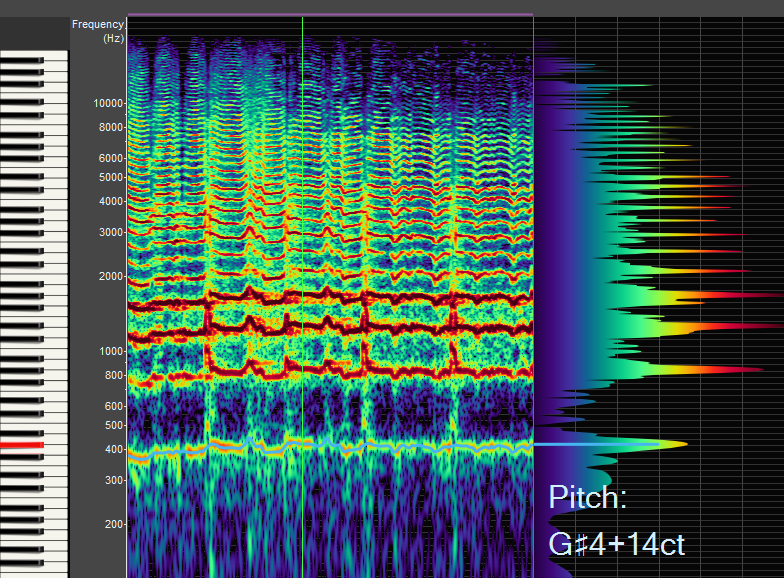 If you have access to voice analyzer software, that can be very helpful in determining specific resonant strategies. We teach online courses designed to help you use technology to focus your resonant strategies and train your body to track them. Timbral contrasts reflect a change in vocal tract shape (resonant strategy) or vocal fold closure (laryngeal coordination). Resonant Strategy: Think about all of the different ways that your vocal tract can change shape. Every one of those changes will produce a different timbre. Laryngeal coordination: the amount of the vocal folds in contact, the rate at which the vocal folds come together, and the angle at which they come together all change the number of harmonics present in a sound, and therefore, creates a different timbre. (see How We Make Sound and Inside The Larynx for more). These changes occur when the 11 tiny muscles surrounding the vocal folds respond to breath pressure from below and acoustic pressure from above, and are as varied as they are complex. Practice basic ways of changing vocal tract shape (lips, tongue, jaw, nasality) and see what sounds you can come up with. Turbulences created at varying points along the vocal tract also effect the timbre, and are used in many styles to add color to the sound (see below). Singers the world over have trained their voices to yodel in order to communicate over long distances, sing their livestock to sleep, create beautiful music, and share in sheer enjoyment, yet, it is one of the stranger-sounding vocal techniques. This is likely because a yodel requires the vocal tract to radically change shape and the vocal folds to change orientation in rapid-fire adjustments that create the tell-tale register "break" that so defines the technique. 1) The vocal tract (primarily Formant 1) makes rapid and relatively extreme adjustments. This typically happens with by singing a low note on a high-pitched vowel shape, and then leaping to a higher note sung on a low-pitched vowel shape. 2) The vocal folds transition rapidly from a muscle-dominant position to a ligament-dominant position and back again (see Inside the Larynx for more). These components make the voice “break” or “crack”, thereby creating the unique yodel occasion and timbral contrast. 3) Epilaryngeal twang remains stable, helping the vocal folds achieve their acrobatic adjustments, and maintaining intensity in the sound even as the vocal tract and vocal folds adjust radically. 1) Start with the famous “Yodel-ay-hee-hoo” on a middle-low pitch in your range (e.g. with a muscle-dominant position). Sing the syllables all on that one pitch slowly, noticing how they each feel different. 2) Do the same thing, an octave higher, and let it feel lighter on the voice (e.g. with a ligament-dominant position). Notice how the sound feels different. Does each syllable feel relatively the same as when you sang them on the low pitch? What has changed? Still pay attention to whether or not tension has crept in. 3) Now, excerpt the [o] and [u] or [e] and [i] from the line. Sing the lower pitch on "oh" or “hey” and glide to the higher pitch and back down maintaining a muscle-dominant position. Do the same thing on "who" or "hee", but in a ligament-dominant position. You may need to start high and glide down for this one. 4) Then put them together. Start by singing the "oh" or "hey" on the low note, then glide up to the high note while slowly switching to the "who" or "hee", then glide back down, and back up, etc., allowing the vocal fold configuration (e.g. sense of weight in the sound) to change. 5) Now you’re ready to create the "break". Rapidly move from the low note on "oh" or "hey" to the high note on "who" or "hee", and see if the tell-tale “break” emerges. If so, try different combinations, with the whole “Yodel-ay-hee-hoo” phrase, letting the “break” run free. 6) Try doing the same thing while adding a whine to induce twang, and help create evenness to the sound. 7) Once you feel comfortable, play around with it, see how fast can you go with “Yodel-ay-hee”? Can you use different syllables? How slow can you go? What do you notice going on? 8) Now see if you can keep up with Franzl Lang. What do you hear him doing? What do you notice? This image represents the relative pitch of the first formants of several vowel shapes. Combine high pitched vowel shapes with low notes, and low pitched vowel shapes with high notes. This will often feel opposite to a vocalists instinct, as it will create a resonant strategy that destabilizes the vocal tract, helping to create the yodel "break". In this image, taken using Voce Vista, the first vowel shape on the left is [e] and the second is [i] (e.g. "yodel EY-EE hoo"). The [e] is a higher-pitched F1 vowel shape, and the [i] is lower-pitched F1 vowel shape, as evidenced by the thick orange line that drops from @450HZ [e] to @300HZ [i]. When sung on a G3 [e] to G4 [i] octave leap, the first formant (F1) moves from a hey resonant strategy (2nd harmonic boost) to a whoop resonant strategy (first harmonic boost) rapidly. This acoustic transition triggers a change in vocal fold configuration, moving from a muscle-dominant position to a ligament-dominant position, and encourages the vocal "break" associated with yodeling. Note that the twang region (@2500-3500HZ) remains stable, helping the vocal folds to achieve their acrobatic adjustments and maintaining intensity in the sound even as the vocal fold configuration changes. Ingressive vocalizing is the act of vocalizing while drawing breath into the body. It can sound kind of crazy, like dinosaur incubation gone wrong, but it’s actually used by some practitioners to develop more consistent, healthy vocal fold closure. Ingressive vocalizing closely into a microphone can sound like a deathly scream with very little effort, creating interesting effects. What happens when you ingressively vocalize? 1) Whereas, when you normally inhale, your vocal folds abduct (open), when you ingressively vocalize, you adduct (close) them. 2) You vocalize until your lungs fill up, and you have to exhale. 3) Your folds move into a ligament-dominant position (see Inside the Larynx), which means that they are thinner. 4) It encourages the folds to coordinate in ways that require more of the bring together (arytenoid) muscles to engage. This can be helpful for vocalists who want to develop cleaner closure, and a more integrated muscular coordination. 5) Ingressive vocalizing can create a number of interesting vocal effects, and can be used very low or high into the range if desired. 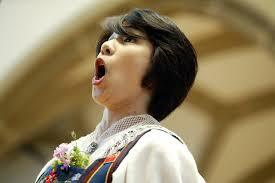 Many composers today use ingressive singing in conjunction with egressive singing (outward) for exciting effects. It can create interesting options for actors as well. Inhalation Phonation Mega Mix from Robert Sussuma on Vimeo. 1) Start slow and drink water, the added air can make your folds feel dry at first. 2) Try starting with a [g] or [h] to help avoid an overly breathy onset. 3) Try ingressive vocal fry to aid in vocal fold closure. 4) Diction is hard with ingressive vocalization, so practice individual vowels and consonants. 5) Glide first, and then work into scales, arpeggios, and other exercises. 6) Go back and forth between ingressive and egressive singing and speaking and notice how focused your egressive vocalizations become. 7) Pay attention to avoid tension. You should feel as relaxed as when singing egressively (outward air flow). For more in-depth information see Amanda DeBoer's doctoral dissertation on ingressive singing. 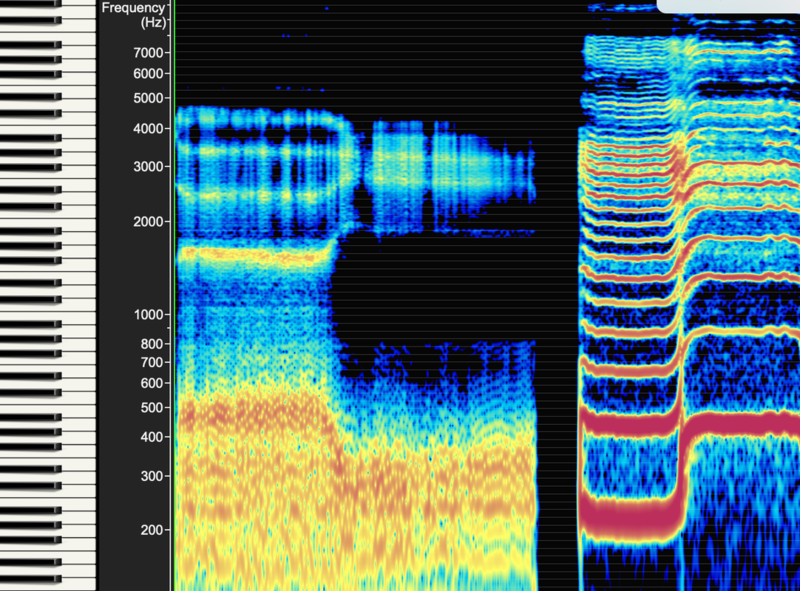 Few extended techniques excite people like the sound of Overtone Singing. To first-time listeners, it may as well be magic, singing two pitches at once, how do they do it?! Basically, overtone singing is the practice of shaping your vocal tract to primarily accentuate one overtone at a time. Accentuation of single harmonics is made possible by positioning the first formant (F1) energy boost in an acoustic mix position often between H1/H2, and clustering the second (F2) and third (F3) formants, then moving them around. Several adjustments are necessary to help create this specialized resonant strategy. See below for stroboscope images of overtone singing, and how it relates to false fold singing (also called throat singing). You can also train your speaking voice to accentuate overtones, but the result is more subtle. Note, overtones are another word for harmonics. 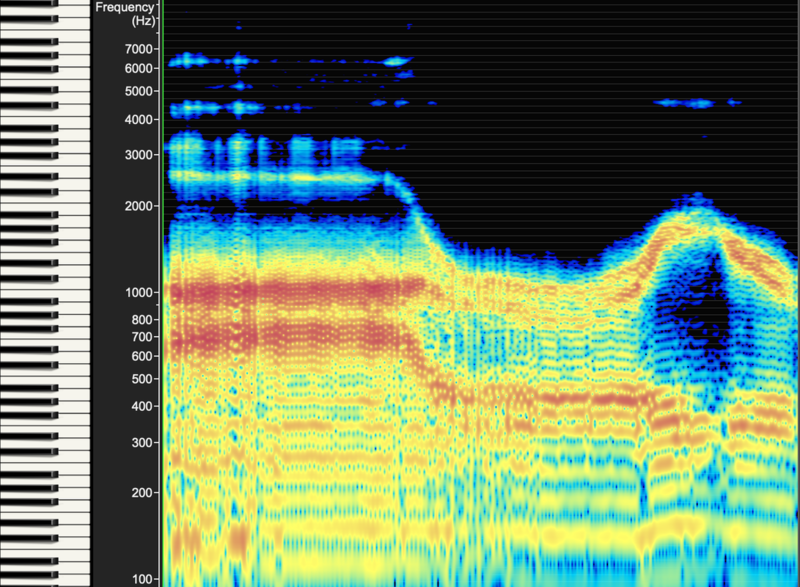 This is a spectral analysis of Anna-Maria's first overtoned arpeggio (at 30 seconds on the video). Notice how the accentuated harmonics (overtones), shown in blue, have more energy than all of the other harmonics. This occurs because of a clustering of formant two (F2) and formant 3 (F3). 1) Get you a good whine. Channel your inner toddler (“I don’t waaannna!”) so that you can create vocal fold stability. You'll feel like you're singing pretty loudly, and that's the goal. The low- and middle-pitched vowel shapes will be essential for creating the necessary acoustic mix with the first formant (F1). Start with a whiny [u]. 2) Choose a pitch near C4 for starters, women may want to go a little higher, men a little lower. Being within a fifth of C4 gives you many harmonics to choose from, and still creates enough space between them for you to pick out individual ones. 2) Create focused areas in the vocal tract. The trick to overtone singing is creating several narrow openings throughout the vocal tract. You'll have one near the back of the tongue from an [ɹ], one in the front of the mouth near the upper teeth from an [l], and one at the lips from [u]/[i]. Look at the "Sehnsucht" video, and notice when Anna-Maria Hefele overtone sings how each of these focused areas look. To achieve these, try the following. 3) [ɹ] (this is an American "r" as in "round"): Begin with a whiny [u] on a sustained tone. Move back and forth between [u] and [ɹ]. Listen for changes in your harmonics. 4) [l]: The [l] is the most critical, and the most challenging. Begin with the same whiny [u] and sing "Loo, Loo, Loo" very slowly. Once that's somewhat comfortable, linger on the [l] for a long time until you feel confident maintaining the [l]. Listen for changes in the your harmonics. 5) Combinging [ɹ] and [l]: Once you're confident with the [l], sustain a note on [l] and add in [ɹ] while maintaining the [l]. Move between [l][ɹ] and only [l]. 6) [u] and [i]: Begin with your whiny [u] on a sustained note. Move only your lips in very subtle ways between [u] and [i], the more subtle the better, though, you may have to be more radical at first to get used to it. Listen for changes in harmonics. 7) Put them together: Beginning with your whiny [u], add the [l] and listen for a harmonic to materialize. Making subtle adjustments with your [ɹ], [u], and [i], listen for the accentuated harmonic to change. Eventually, you can think less about the vocal tract, and focus solely on the harmonics you're hearing. Remember to sing strong, and maintain your whine. 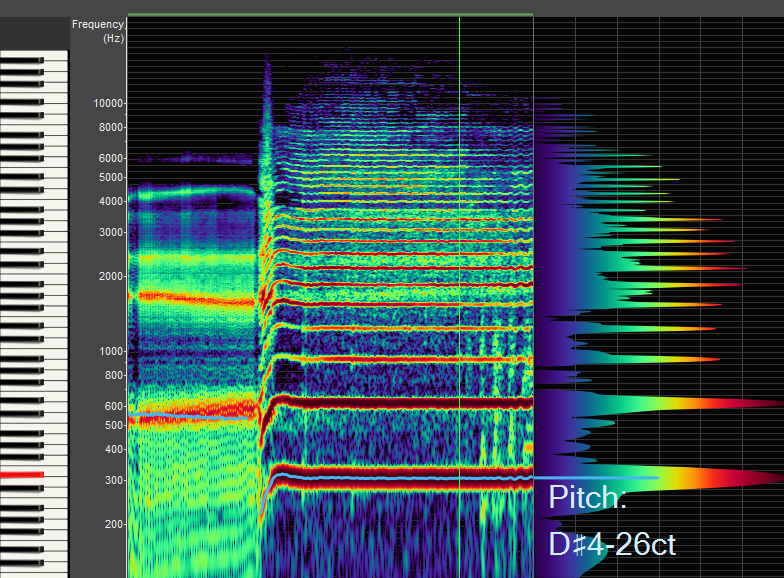 This image, captured using Voce Vista, demonstrates the second (F2) and third (F3) formant coupling shown using vocal fry. 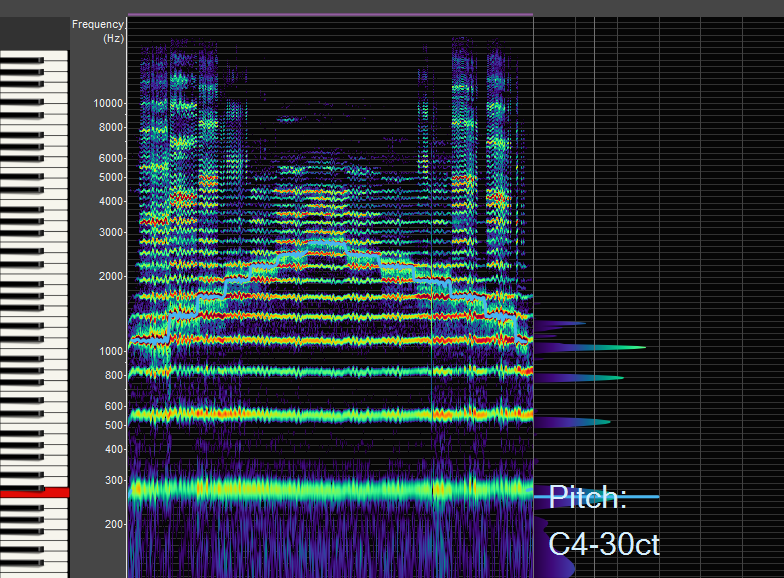 The [a] vowel shape begins (left) with the second formant (F2) @1000HZ and the third formant (F3) @2500HZ. Notice how the third formant (F3) drops to meet the second formant (F2) when the vocalist changes to from [a] to [ɹ]. Also notice how the first formant energy peak (F1) drops, and then remains stable as the second (F2) and third (F3) formants move up and down in tandem. By coupling formants, vocalists bring focused energy to the harmonics that those formants interact directly with. 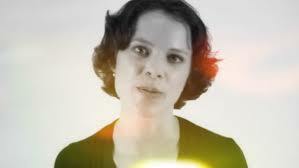 This incredibly informative video of Anna-Marie Hefele singing a German lieder followed by overtone singing provides a wealth of information about vocal tract changes. Notice how stable the vocal tract shape is for overtone singing by comparison to the vowel shapes. 8) Practice scrolling through the overtone series (see our Harmonics Vs. Formants page) and notice the wonderfully colorful way that nature multiplies harmonics. 9) Try changing the fundamental. Choose different pitches to use as your base. How does changing your fundamental frequency (H1) change your experience? Can you change your fundamental while overtone singing? This is sophisticated, and requires a stable vocal tract, but the result is, well, magic. Turbulences occur in two different ways: 1) at the vocal folds and 2) in the vocal tract. There are many options to create turbulence, and many styles that use turbulence. Turbulences can often sound harsh, even as if the person is hurting their voice. To be sure, the kinds of fine-tuned adjustments necessary to create turbulences can lead to tension that can lead to harmful effects. As with learning any new technique with the voice, take it slow if you're going to explore turbulence, work with a professional guide, and listen to your body. If you feel pain or pinching, pause and rest. It's always helpful to work with a studied practitioner who has a track record with teaching these kinds of vocal acrobatics. Equally, many vocal styles that utilize turbulence do so with a microphone, allowing for the vocalist to not be concerned with volume, thereby allowing them to create the turbulence with less physical effort. Almost all of these turbulences need increased epilaryngeal twang in order to be achieved. Always begin with a whine if you want to explore them. This instruction video by Alex Shelest demonstrates several possible turbulences including some at the level of the vocal folds and some in the vocal tract. Turbulence practitioners use different terms for each type of turbulence, so it's helpful to understand the function, so that you can translate their terminology to your usage. A less-used vocal technique, but the most intuitive turbulence, Panting involves creating sound with the vocal folds partially abducted (opened). It will sound breathy, but also have a slightly husky pitched quality. The challenges lie with maintaining vocal tract stability, avoiding pharyngeal tension, and trying not to dry out the folds. 1) Start by practicing a breathy “huh” sound, and notice what it feels like. Where do you feel the breath, how does your vocal tract respond, how do your pharyngeal muscles respond? 2) Try changing the vowel shape and notice what else changes. 3) Try using a soft glottal “uh” and notice the differences. 4) Try speaking sentences and see how quickly you run out of air. Singing with only partially closed folds is even more difficult. Vocal Fry is another turbulence that occurs at the vocal folds. When frying, the vocal folds come together slowly enough to create a pulse tone that has a less-prominent or even absent harmonic series. Vocal fry has gotten a bad wrap in the last few years based on its common usage among speakers of the Millennial generation. Far from being a risk to vocal health, the fry can actually be used to create healthy vocal experiences. The vocal health challenges with fry appear if the vocalist only uses vocal fry, leading to less flexibility with other vocal fold configurations, or attempts to create significant volume from a fry position, which could lead to tension. Fry glides to sustained onsets can be very effective tools for creating even onsets. In compositions, vocal fry can create interesting harmonic opportunities. Some people have trouble accessing a vocal fry at first, so here are some ideas for achieving fry. 1) Start with an [a] glide from the middle of your range downward. When you get to the bottom, let your voice crackle. 2) Imagine you're a dog or a tiger and growl. 3) Try frying with your mouth closed in an [m] position. Keep the sound easy. 4) Try a creak instead. This is a pitched fry higher in your range. You might try sounding like a creaky door or an angry house cat. The creak glide can be an effective training tool for the C4-C5 octave onset. 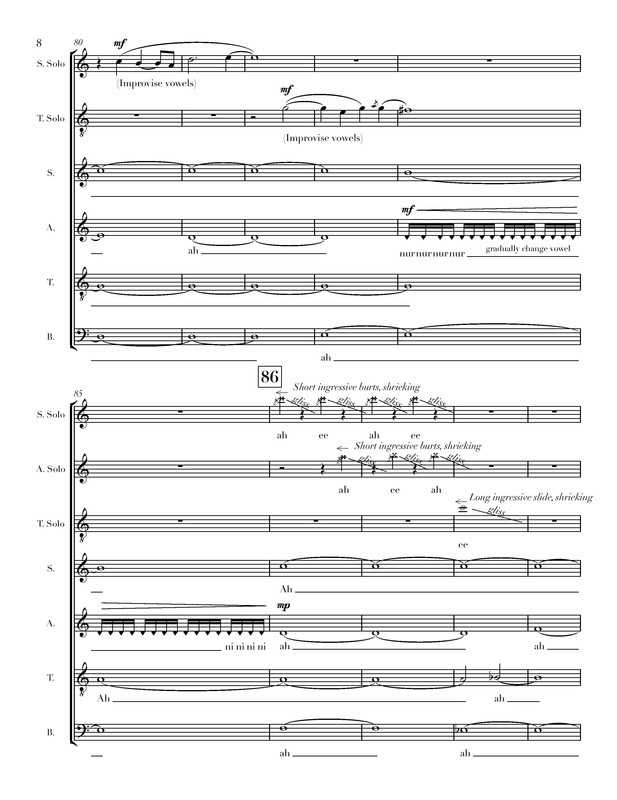 Toby Twining's "Hee Oo Oom Ha", performed by C4 and conducted by VoiceScienceWorks' David Harris, incorporates stylistic vocal panting, vocal fry, overtoning, and yodeling. In this video the vocalist belts cleanly, and then belts with an arytenoid rattle. Notice how narrow the epilarynx tube becomes in order to achieve the rattle. You can see the arytenoid cartilages (the little nobs at the top of the screen) bumping into each other on the second vocalization to create the rattle. The Arytenoid Rattle is a favorite among metal musicians and some RnB and jazz singers who want to accent their more forceful moments. Basically, vocalist adjusts their larynx such that the arytenoid cartilages come close enough together to bump into one another and rattle. Since we can't feel the larynx, it's hard to know when it happens until you hear the rattling sound. People who attempt the arytenoid rattle will often pinch the larger muscles of the throat, creating tension, and sometimes a painful experience. As with all attempts at turbulence, start with a nice amount of twang, and move slowly into the creation of sound. This is one of those turbulences that is often helpful to have a practitioner guide you into. False Fold Turbulence, also called Throat Singing and Multiphonic Singing, occurs when the epilarynx tube narrows enough to bring the false folds into contact. The false vocal folds sit just above the true vocal folds, but only make sound if they are brought into contact by significantly narrowing the epilarynx tube. Tuvan Throat Singing includes a highly specialized version of false fold turbulence (see the video below). Tuvan singers have honed their skills over centuries, crafting an unique art form. Their music involves a combination of false fold turbulence singing and overtone singing. Sometimes the same individual does both, sometimes one person uses their false folds while the other(s) overtone sing. False fold turbulence is also used by character actors and in some forms of singing like death metal and jazz and RnB at selected moments. If approached with a narrow epilarynx tube (twang), false fold turbulence can be achieved in a healthy way. Other types of turbulence occur across the upper parts of the vocal tract as well. The epiglottis can be brought into a rattle, the tongue can trill, the soft palate can rattle against the tongue, and the lips can trill in addition to liquid being rattled between different parts of the vocal tract. Turbulence can be an interesting way to augment sound production, and, when approached from a healthy standpoint, can augment a vocalists repertoire. This compilation video by turbulence specialist Brandon Kennedy demonstrates many of the turbulence options at the vocal folds and in the lower part of the vocal tract. At 3.20 he demonstrates false fold turbulence, sometimes doing it in conjunction with an arytenoid rattle (this is more true at the beginning of the video). At 5.00 he demonstrates how he uses twang to set his vocal tract up to create the turbulences. He falsely labels "twang" (epilaryngeal focus) as "nasality" (soft palate lowering), a common misconception, as people tend to feel the result of twang behind the nose, in a similar location to where they feel nasality. You can also see him demonstrate epilaryngeal narrowing (twang) without turbulence, overtone singing (notice how the tongue position changes), and vocal fry and creak (notice the vocal folds pulsing at 5.45). He shows how he employs several of these turbulences in metal vocalizations around 4.00, and there is a slow motion version around 6.00. In this Science Friday video, Speech Language Pathologist and PAVA President Elect Aaron Johnson helps to explain how Tuvan Throat Singers use false fold turbulence and overtone singing to create their unique music. At 4.30 you can see how profoundly focused the epilaryngeal tube of the Tuvan Throat Singer is followed by a graphic of their overtone singing. 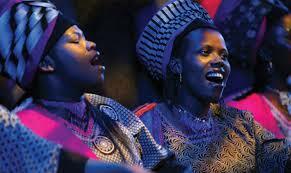 Range is one of the more didactic elements for most vocalists, and is used to define a vocalist in extreme ways. Volumes have been written on how certain voice types can sing certain notes and not others. These assertions are backed up by biological suggestion, yet, there are countless examples of tiny people singing really low notes, and large people singing really high notes. Range identifiers tend to be fuzzy at best, and are typically determined within the confines of stylistic dogma. These pronounced limits coupled with challenges that vocalists feel with coordinating their vocal folds and vocal tract to achieve new notes and colors seem to close the books on most people exploring new parts of their range. Much of what vocalists consider to be range-defining elements are the result of vocal fold, vocal tract, and breath pressure coordination. A classic example can be experienced at the lower end of the vocal range. For what we might call an "average" sized male, the vocal folds have to learn to coordinate differently around G2 (bottom line of the bass clef staff). At this frequency the CT (stretching) and TA (thickening) muscles virtually ceasing to influence the vocal output. This means that the arytenoid muscles (bring together) have to take up the slack to keep the breath pressure from pushing the folds apart. The vocal tract, especially the epilarynx tube, is essential in this coordination as well. This is a distinctly different coordination than occurs for the next four octaves above G2 (which tends to be highly influenced by CT and TA interaction), and takes intentional training on most people's part to access it. People with smaller vocal folds will experience this same phenomena at higher pitches. See Lowell, Soren Y. and Brad Story. Simulated effects of cricothyroid and thyroarytenoid muscle activation on adult-male vocal fold vibration. Journal of the Acoustic Society of America. April, 2006, for more information on this adjustment. In the 1960s the actor and philosopher Roy Hart, building off of the work of Alfred Wolfsohn (voice teacher) and R. Luchsinger (otolaryngologist), promoted the idea that the human voice has access to 8 octaves. He suggested that societal expectations and training, mixed with an individual's psychological accumulation, led to people being unaware of and unable to access these extra parts of their voice. His devotees continue to explore his premise with interesting, if anecdotal, experiences. Research into Hart's assertions is still outstanding, and listening to the recordings on his website, the definition of "range" is in need of expansive definition, but his interest in exploring the voice in creative ways is inspiring. This is especially true in contrast to canonized dogma on range that is mostly reinforced in the science community by observational studies, many of which date back decades or longer.